Friends Make Us Stronger... the Friends of the Mississauga Library System is a volunteer, nonprofit citizens' organization which was established in Mississauga in 1989. Its main purpose is to promote literacy and extend the programs and services of the library system in this community. If you want information about the Friends of the Library, email them at friendsofthelibrary@rogers.com. 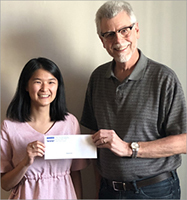 Pictured here is Victoria being presented with a $2,000 cheque by Michael Jones, President of the Friends of the Mississauga Library System on June 21, 2018. 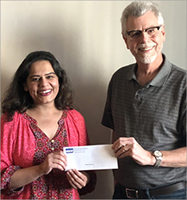 Pictured here is Saima being presented with a $1,000 cheque by Michael Jones, President of the Friends of the Mississauga Library System on June 21, 2018. Bargain hunters and booklovers take note that the Friends of the Library holds an on-going sale of adult and children's fiction and non fiction books in hardcover and paperback. Most books withdrawn from the Library or donated by the public are priced $2 or less. Book donations by the public are accepted at the Library. Funds raised support the programs and services of the Mississauga Library System. Friends of the Library book sales feature 1000s of adult and children’s fiction and non fiction, hard cover and paperbacks. Book sales operate at all Mississauga libraries. Most books are $2. Book sales raise $90,000 each year and help distribute 100s of thousands of affordable books back into the community. Used books - at all locations. More Information. Residents are invited to join the Friends of the Library a non profit, volunteer, citizens' group established in 1989. Its main purpose is to promote literacy and extend the programs and services of the Mississauga Library System within this community. Can you spare 3 hours a month to volunteer in support of your Library? Of course you can, call the Friends' hotline at 905-615-3200 x 3604 and help make a great Library even better!